I missed logging on and sharing pictures and recipes and such, but I never really knew where my blog was going. I just knew that I liked sharing my life with those who chose to read about it, be it funny experiences or run-ins with crazy folks or kitchen experiments. But somewhere between June and August, my life took a different turn. One I’ve been waiting on for a long time that I never thought would happen to me. 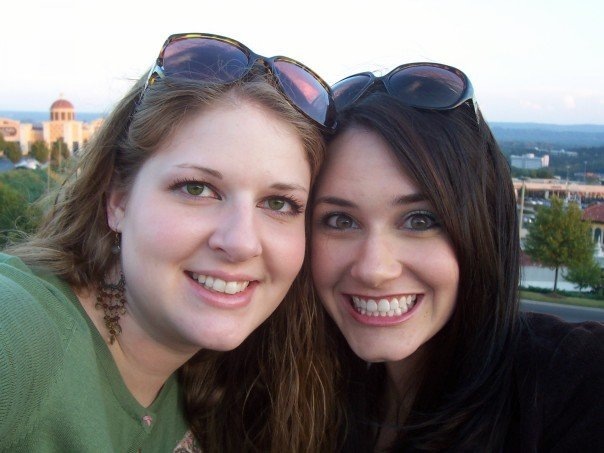 This past May, I visited one of my BFFs from college, Kristin, in the VA/DC area. And I fell in love. And I know to some friends and family it seems as if I fall in love with whatever city I’m in at the moment, but this was different. I loved the culture, the history, the people, the city…it was just awesome. And there seemed to be so many job opportunities. While we were riding the Metro, I noticed an advertisement for a company I liked. Then I realized that they were based in DC. And as luck would have it, they were hiring. When I arrived home, I consider applying a dozen times, but I never thought I would be considered. I didn’t have the confidence in myself. Kristin encouraged me to apply, and halfway into the summer I did. Shortly after, I had a phone interview. Then an editing test. Then I was given an offer I was thrilled with: the option to freelance and possibly be considered for a full-time position down the road. I took it. Slowly the writing assignments came until I was writing 5 per week. Then sometimes more. I took every assignment my editor came to me with , anxious to prove that I could do it – not just to them, but to myself as well. And while I was busier than I’d been in a very long time (with my full-time job as well), I loved it. Fast-forward to November, and I was contacted about the chance for a full-time job…in DC. I jumped at the opportunity. All my interviews were done via Skype, a testament to how much technology is changing the way everything operates. After a painfully long holiday break waiting to hear something, anything, I got word one week and a day after I interviewed: The job was mine, and I was moving to DC. So there you have it. I’m sitting on a couch at my friend’s house, waiting for my parents to bring along the rest of my stuff next week when I move in with my new roommate, in my new city. 2011 brought many great surprises, but I know that 2012 is going to be a year of new adventures and personal discoveries. The world is changing, and for once, I feel like I’m changing with it. 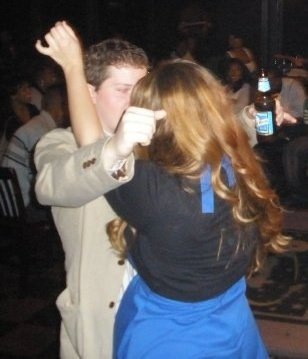 At the close of 2011, I ended an amazing four-and-a-half-years-long chapter of my life that included graduating college, completing my dream internship, the start of the best relationship I could never imagine, and making the most incredible friends. But the book isn’t over yet, and this new chapter promises to be just as exciting. I miss my family and friends, but I know that this is a huge step that I needed to take. I’m excited to continue to write more of my life’s story while engaging in various shenanigans with a new job in one of the country’s most bustling cities. And while I don’t necessarily think that I’m smarter than everyone in my hometown or that they “think small,” this part of the song struck a chord with me. Anyway, if you made it to the bottom of this, congratulations! So I’ve gotten to where I actually like spin class, and I’ve been trying to go at least once a week, if not multiple times. I like most of the teachers, with the exception of one who shall remain nameless. She’s just not motivating, and she talks way too much during class. She’ll say things like, “You should be dying to stand up. You should really, really want to, but I’m not going to let you!” Or “Your quads should be burning right now…like, really on fire!” I mean, yes, my muscles are burning, but usually with other teachers I’m so into it that I’m not focusing on the pain. Another thing: She uses the same playlist. Every time. Even if the music is bad in a spin class, as long as it’s not the same damn thing every time, it’s not so bad. There’s another instructor who isn’t necessarily a favorite but is still…entertaining. He plays a mish-mash of music and says the strangest things during class. For example, one class had a Michael McDonald-heavy playlist followed by two gospel songs at the very end, followed by some elevator music that sounded curiously like “The Girl from Ipanema.” Other times he’ll play R&B/pop hits from the 80s/early 90s. I feel like I’m riding a bike while watching Splash or Mannequin. Needless to say, the class is actually pretty fun/funny and goes by fairly quickly. It’s almost worth it to go just to wait for the ridiculousness to come spilling out. Does anyone else have any exercise instructors who are as, um, entertaining? Posted in Exercise, Random and tagged exercise, funny, Michael McDonald, spinning. Bookmark the permalink. I know, I know…it’s not Father’s Day. But Sunday was, and I didn’t get a chance to blog about my awesome dad—I was too busy having dinner with him and thanking him for helping me track down tires for my car! 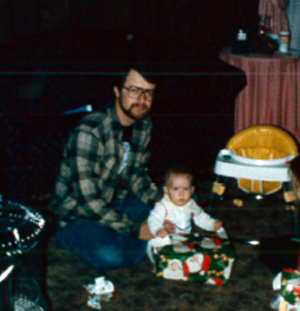 Christmas...dad had an unlimited supply of those scratchy plaid shirts. That’s my dad in a nutshell. He does so much for me, and most that come to mind immediately are automobile-related. Oil change? Call dad. Engine running hot? Call dad. Horrible wreck on the side of the road involving an overturned Sunfire and a disfigured magnolia tree? Uh…call mom, and then have her call dad. Dad has an eye for fashion. 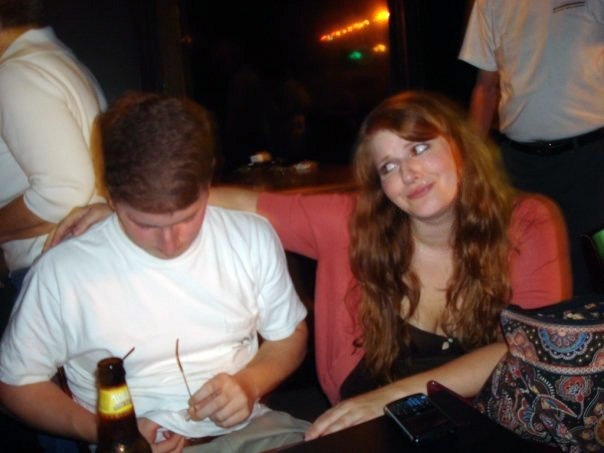 Fun fact: He STILLS owns that shirt he's wearing. My dad is also the one with all the answers. This bothered me when I was younger, because he thought he knew everything, and only now do I realize that he kinda sorta does. 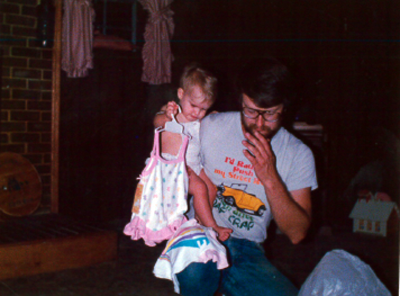 It’s hard to admit because I am just like my father: hardheaded, stubborn, and yes, smart. I call my dad for the final word on most everything, because I just need him to tell me it will be alright. He’s talked me down in a lot of situations, and he’s gotten me out of many scrapes. 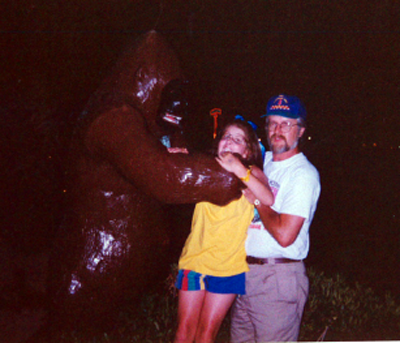 Like that time he saved me from that bear...or is that a gorilla? Other things my dad has given me? My green eyes (his are more brown), a great head of hair, a (sometimes) short temper and a strong work ethic. 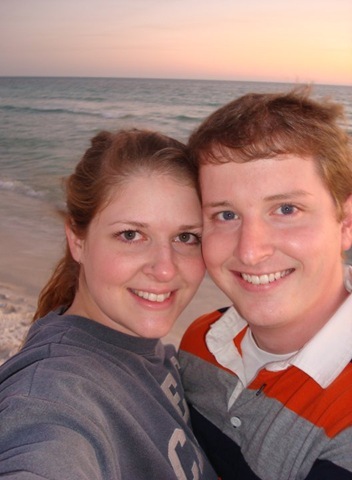 He’s worked very hard to build a good life for himself, his wife, and his two girls. After the steel mill in our town (which supported many, many families in our community) shut down, my dad was forced to find something new after almost 25 years in the same job. But he did it. My grandfather, my dad’s dad, passed away unexpectedly when he was only 71. My dad was 46. I remember seeing him break down in a way that I didn’t think dads were capable of; I thought dads were too strong for that. Dad always told me that he never got enough time with his father; 46 years just wasn’t enough. My dad will be 60 this year. I find myself striving for his approval more and more these days. I want him to like me. I want him to be proud of me. I want him to see me, and know that he was a positive influence and that he’s been the best father I could ask for. Posted in Pictures and tagged Auburn, Dad, Father's day, memories. Bookmark the permalink. If you’ve ever read my friend Mandy’s blog, you might know that she actively supports local farming by participating in a CSA. Last year, she bought the Grow Alabama box, but after disappointment regarding some foreign avocados, she decided to make a switch. 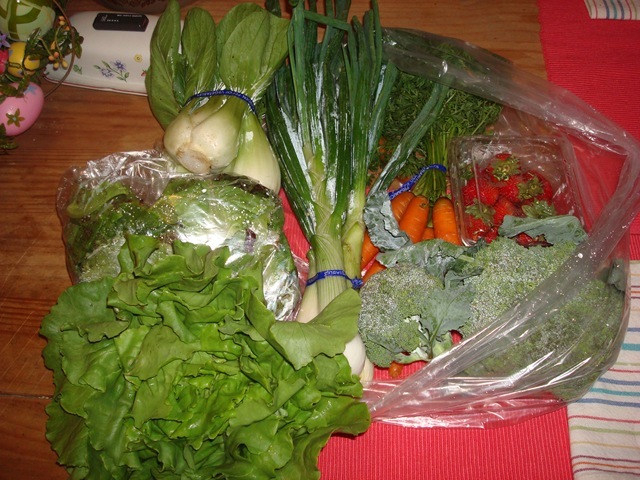 Lucky for me, she asked me to split a CSA from Snow’s Bend in Tuscaloosa, a farm that my friend Jason also supports. The first few weeks were a little sparse, but still delicious, with strawberries, lettuce mix, green onions, radishes and greens. But the last few weeks, the crop has been both bountiful and beautiful. Mandy and I alternate weeks, and for my last few pickups, I’ve received quite the haul. 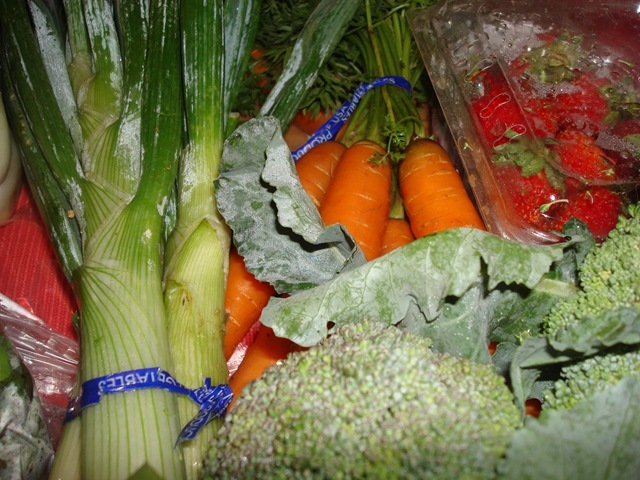 Spring onions, carrots, broccoli, radishes, lettuce mix, butter crunch lettuce, baby bok choy and strawberries. I can’t get over how precious these carrots look! I remembered to follow Sarah’s advice and cut the tops off immediately after I brought them home so as not to let them dry out. The bok choy really interested me, and Jason informed me that it was one of the best veggies they produce at Snow’s Bend. 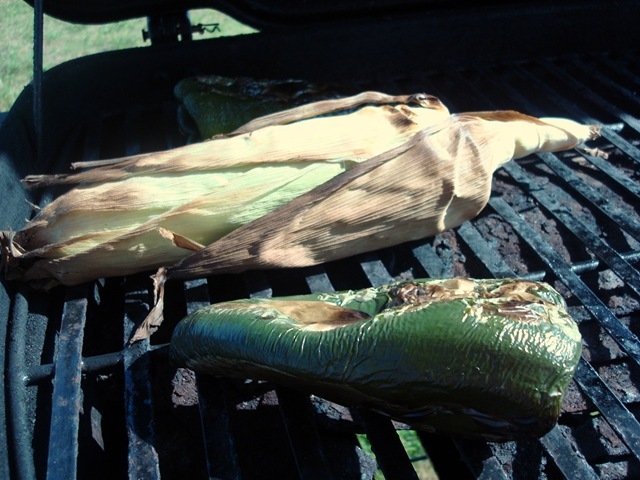 I wasn’t sure how to cook it, but I was anxious to try it out. My first experience involved stir-fry, but it didn’t turn out quite how I wanted it to. The leaves were a little rough-looking, and I don’t think I chopped it up in the most efficient manner. 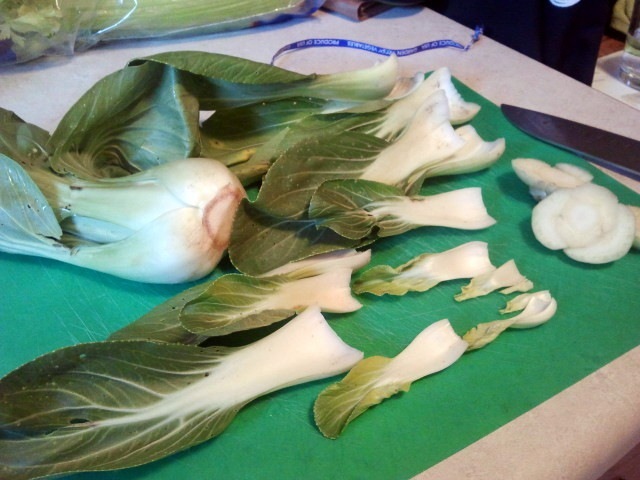 From what I recall of the way bok choy tastes, I lump it with celery or cabbage, though I’m sure some would disagree. After a little thinking, I knew just what I wanted to do with it: egg rolls. 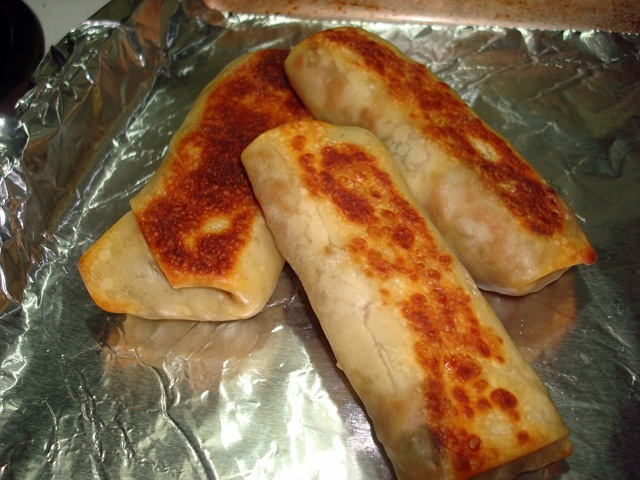 In fact, every single thing I put inside these egg rolls, barring the seasoning and the celery, came from the CSA loot. To start, make sure all your veggies are chopped and ready to go. 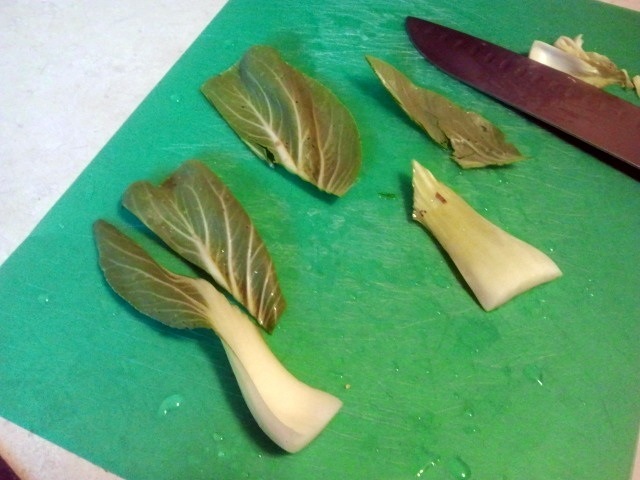 For the bok choy, I cut off the base, just enough so that the tender leaves separated. It’s the Russian nesting doll of vegetables—at the end is the itty bitty baby bok choy. So cute! You may need make additional cuts as you get closer to the inside. Inspect for dirt and wash thoroughly. 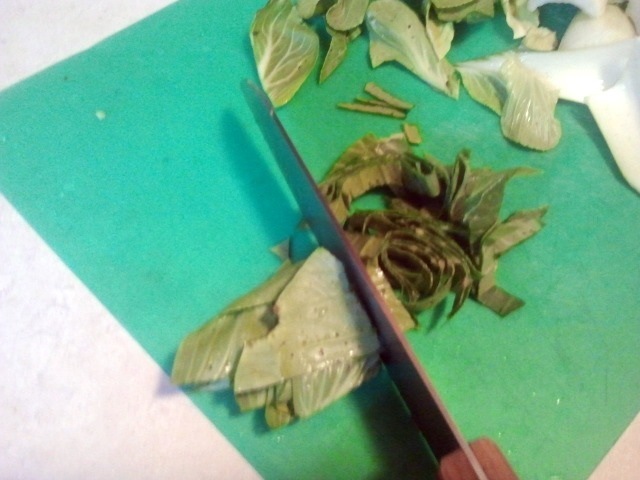 I then cut the leaf from the heavier part, using diagonal cuts, separating the leaves. On the left, the first cut; on the right, the second cut to strip away the rest of the leaf. 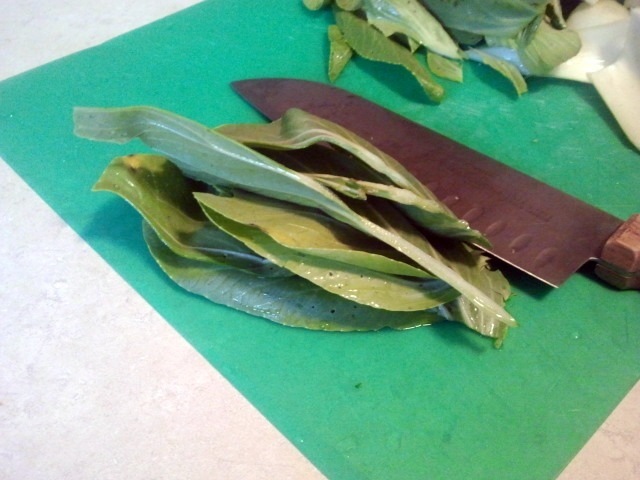 I then stacked several leaves and cut them up into strips; set them aside. 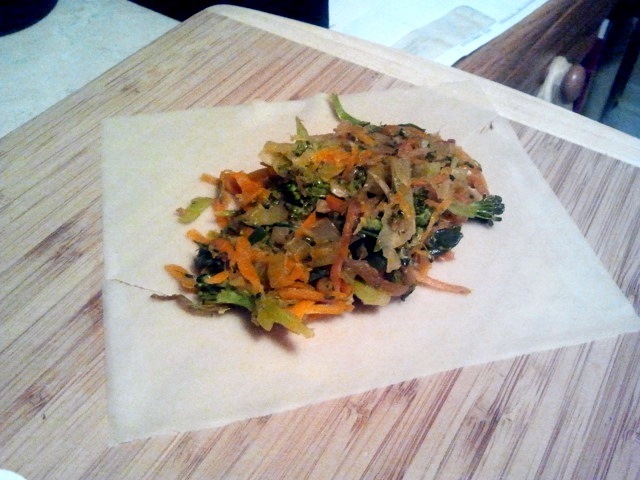 You can also roll them up tightly and then slice. For the rest of the veggie, dice much like you would celery,and make a few extra chops so that there aren’t any pieces that are too big. Peel the carrots and grate in a food processor (the best time saver EVER). 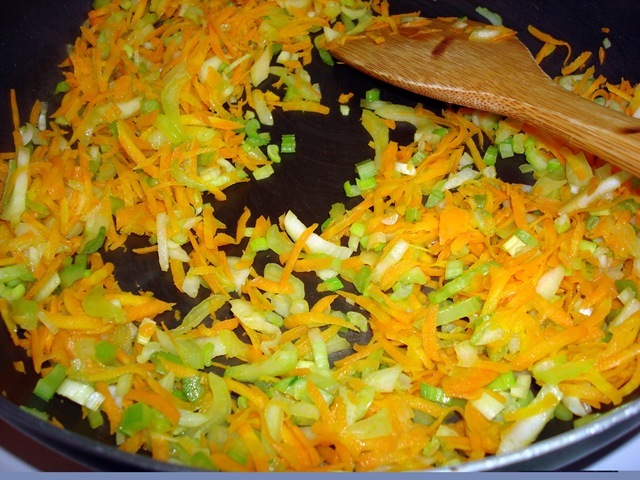 Chop the green onion and celery. 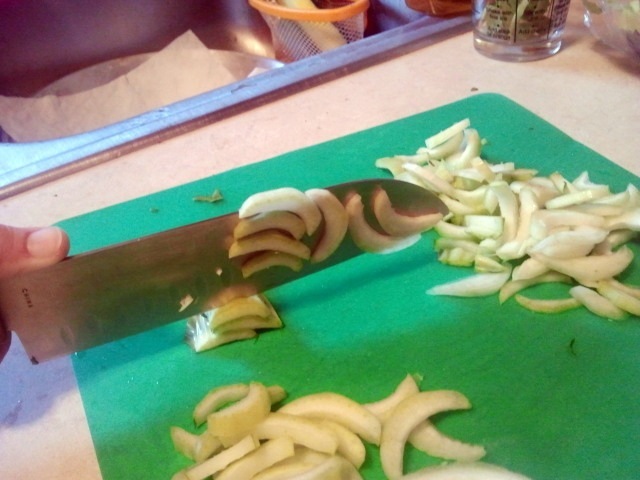 (Tip: I cut the celery into strips length wise, making about three cuts, then diced.) Chop the broccoli into small manageable pieces. Heat about 1-2 tsp olive oil in a skillet or wok (preferably one with an accompanying lid). Toss the bok choy (but not the leaves) in, along with the carrots. Add the celery, then the onions, then the broccoli. Sprinkle approximately 1 tsp ginger and about 1 tbps soy sauce over the veggies. When the broccoli is bright green, add the bok choy leaves, remove from heat and cover. To make the egg rolls, separate one wrapper from the stack. Moisten the edges using your fingers and a little water. (That’s what she said.) Make a small pile of the filling in the center of the wrapper. Pull one corner up and over, and fold the edges in (it’ll look like an envelope), then roll upwards. Continue on until you run out of filling. Spritz a foil-covered pan with some olive oil, then line the egg rolls up. Give the rolls a another mist of oil, then pop in the oven for about…ten minutes? I just kept an eye on them. Then flip over (they should be a crusty brown) and bake a few more minutes. Served with your favorite dipping sauce or plain, like I did! Soooo good. I suggest you head to your nearest farmers market this weekend and get rollin’! 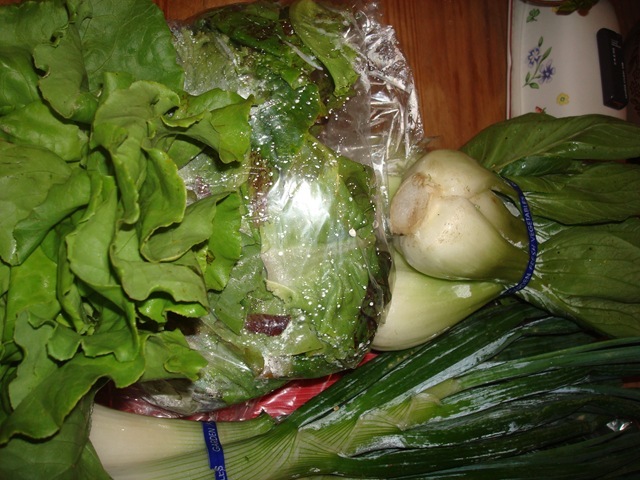 Posted in Food, Recipes and tagged bok choy, CSA box, egg rolls, recipes, vegetarian. Bookmark the permalink. 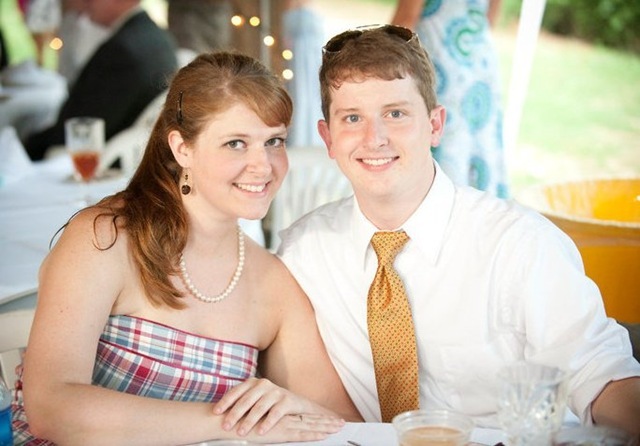 Three years with this guy. 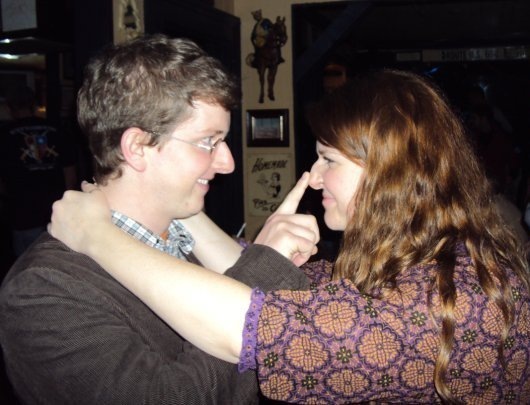 Hard to believe, but Jonathan and I have been dating for (over) three years. 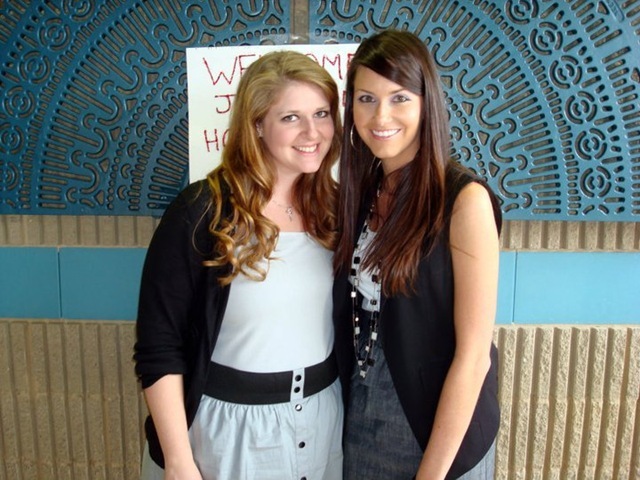 It all started back in 2007 at JSU, where we first *really* met. Emphasis on the really, because we’d had two brief encounters before we actually had a real conversation. 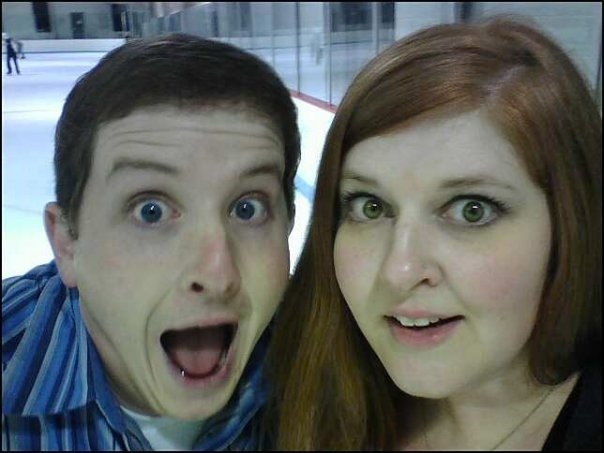 Oddly enough, we went to college together for four years, in the same department, and we never met. 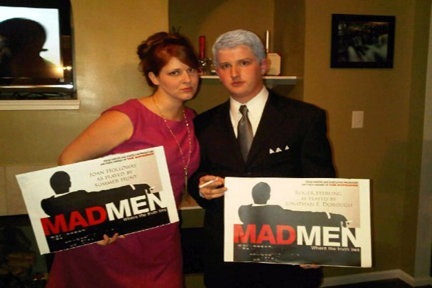 We were a pretty unlikely couple, he and I. To some, we couldn’t be more opposite, our biggest division being political: he, a staunch conservative; I, a tree-hugging liberal. But we make it work. Our differences are what bring us together; he is my Mr. Right (Wing). I never was the relationship girl, and I feel like I’m living proof that love hides in the most unexpected places, and it truly does happen to you when you least expect it. Because honestly. 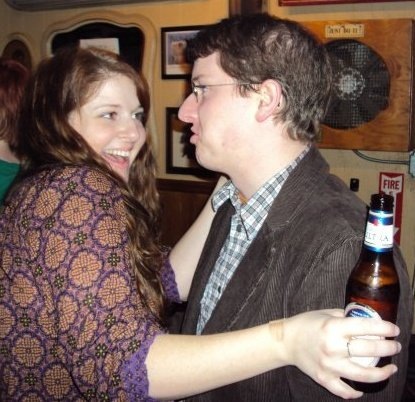 Who would have put the journal-toting, tree-hugging, can-recycling liberal lady with this straight-laced, clean-cut conservative “fraternity man”? 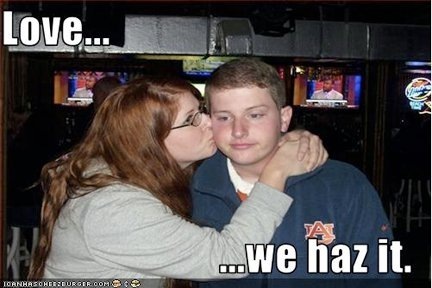 Well, maybe he’s not as straight-laced as he looks. Differences or no, it’s been a good three years, never short on surprises and fun times. I love you, babe. Posted in Friends, Pictures and tagged anniversary, boyfriend, love. Bookmark the permalink. Way back when I was in college, during a time when Facebook was new and reserved only for college kids, there was an option on the burgeoning social network to put in what classes you were taking. And like all the other cool kids, I put in my schedule. Shortly thereafter, I found myself with a handful of new adds from people I’d not yet met but who I’d be having class with that fall. It was actually a pretty clever function; we could set up study groups and such and communicate missed assignments. I remember noticing one girl in particular who added me and who I’d never seen around. 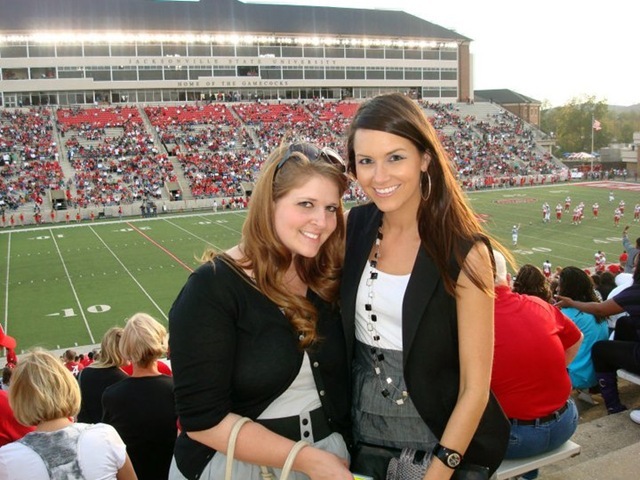 On my first day of PR Writing at JSU, I sat in the back. I saw a vaguely familiar head of hair sitting in front of me. 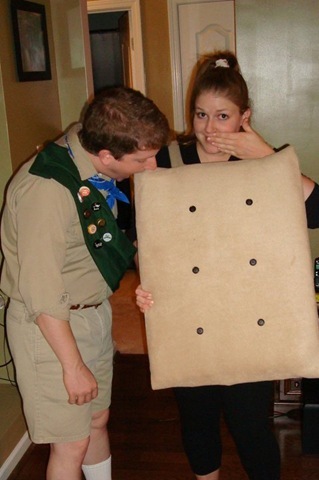 I tapped her on the shoulder. “Excuse me, but are you Kristin?” I asked. The beautiful girl nodded and smiled at me. And the rest is friendship history! 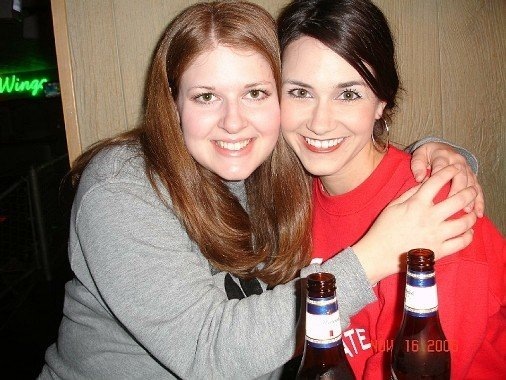 Kristin and I became fast friends, and as I remember it, that very first week, she invited me out to dinner and drinks with her friends. She was not only the most gorgeous girl I’d ever seen in real life, she was also super down-to-earth and funny. 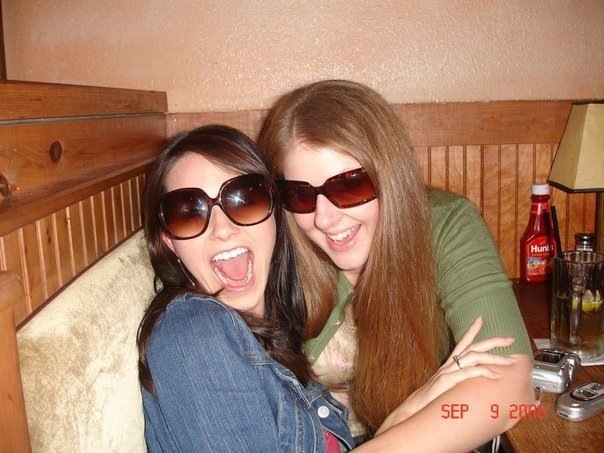 We spent many a late night drinking wine, eating cookie dough and laughing our asses off. 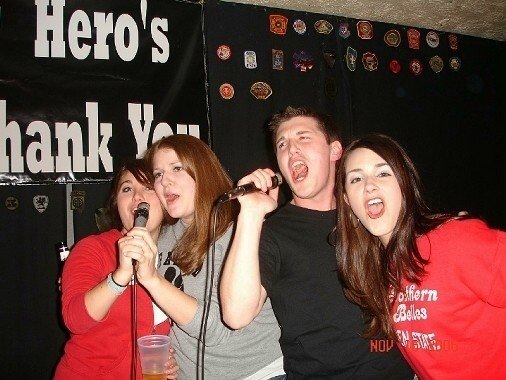 We were study buddies, drinking partners, and karaoke queens. Kristin and I, along with my friends Kevin and Kaitie, became a very close-knit group within the communications department. 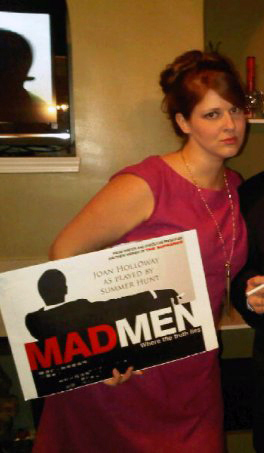 In 2007, Kristin moved to New York for a fabulous internship, and it was a big change that soon became semi-permanent. We kept in touch, and no matter how infrequent our conversations may have been, she was still one of my very best friends. I swore I’d come for a visit, but the money and time were never available. The next year, Kristin moved home for a little while, and we were able to see each other a little more. But before I knew it, she’d found a new job and new place to call home: Washington, D.C. (Virginia, to be more correct). A lot closer, but still so far away. 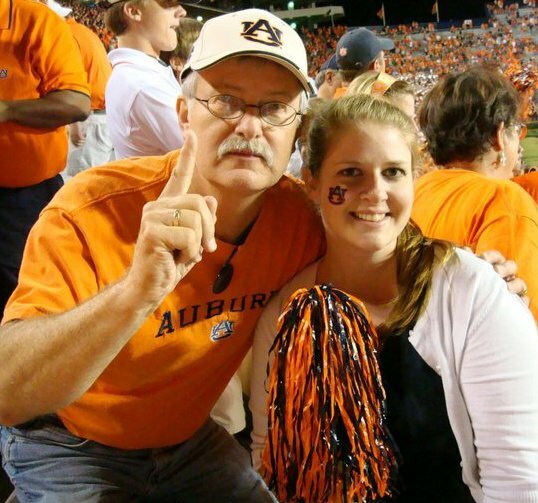 We continued to have sporadic visits as she returned home to see family, including a fantastic whirlwind trip last fall when we attended our alma mater’s homecoming festivities. This past March, I decided to check out flights on AirTran, on a whim. Kris had told me she’d been able to find reasonable tickets between two smaller airports, and I just had to see. As luck would have it, I found a round-trip ticket over Memorial Day weekend—for just under $150 total. 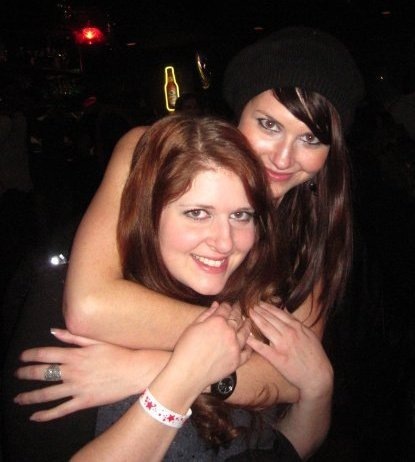 So in less than 24 hours, I’ll be DC-bound and reunited with my BFF Kristin. We’ve been looking forward to this trip for a very long time, and I foresee a lot more wine and late-night chatting on the agenda. 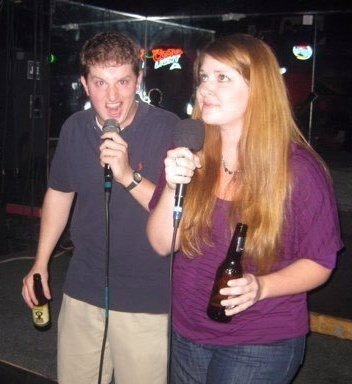 And if we’re lucky, maybe a little karaoke. Take a few minutes to make a phone call to someone with whom you might have lost touch. I’m sure it’ll brighten both your days. I hope you all have a fantastic Memorial Day weekend—see ya on the flip side! Posted in Friends, Pictures and tagged friends, travel, Washington DC. Bookmark the permalink. we can’t keep meating like this. So as you know, I’m gradually dipping my toes back in the meat-flavored water after a short hiatus during the season of Lent. One my first meat-centric recipes back on the wagon was this delicious turkey-spinach-feta turkey burgers. 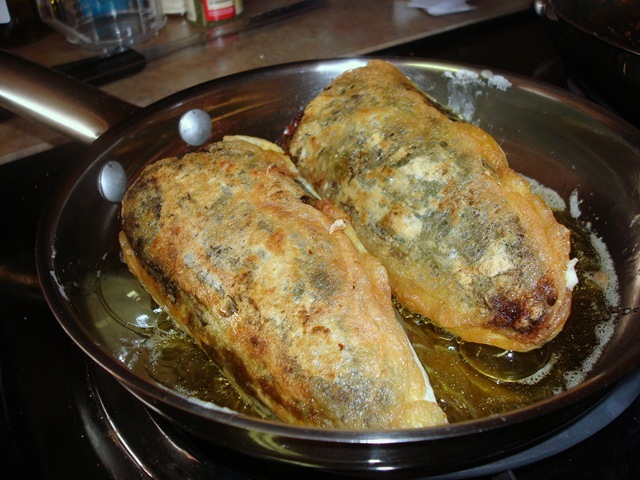 Jonathan and I decided to take the leftovers and recreate one of our favorite restaurant dishes at home: chile rellenos. 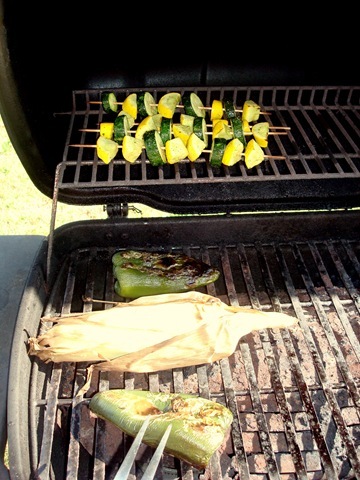 We started out by roasting the Poblano peppers on the grill, along with ears of corn and skewered veggies. 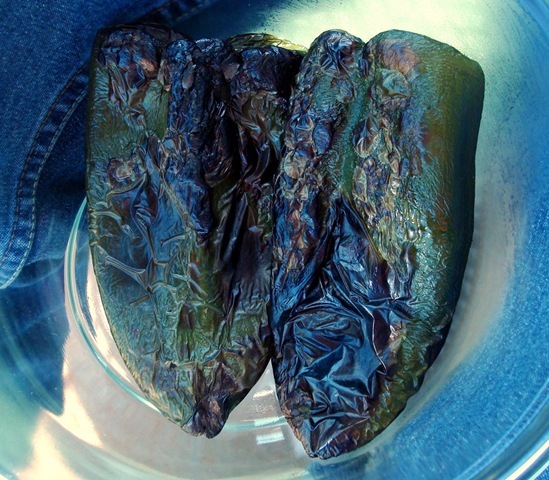 To roast the peppers, we blackened them on the grill, then put them in a bowl and covered them with plastic wrap and let them sweat it out a while. (Emily would be so proud!) Then we just peeled off the skin. Easy peasy 😉 Or easy pepper-y. 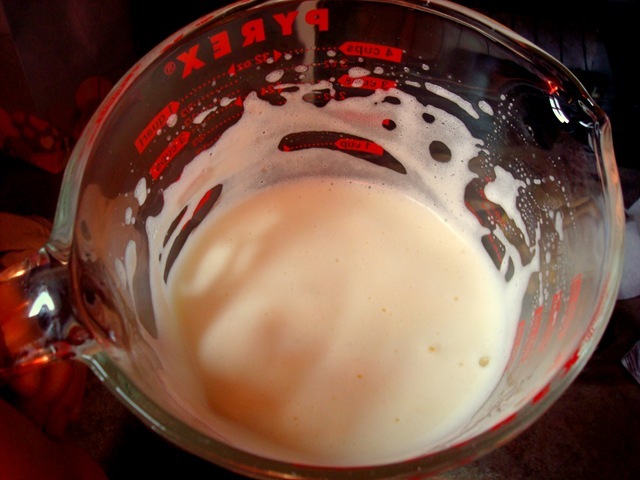 For the batter, I whipped one egg white (into a frenzy, of course), then folded in the yolk. 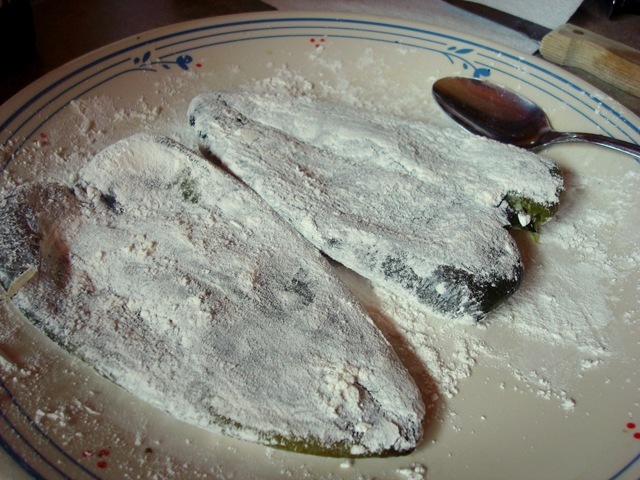 Then I dipped the floured and stuffed peppers in the mix, and from there, it was a trip to a nice, hot olive oil bath. Look how crispy! Just like the pros. With a side of homemade guac and some chips, it was the perfect Mexican feast. Not too shabby for my first try, if I do say so myself. 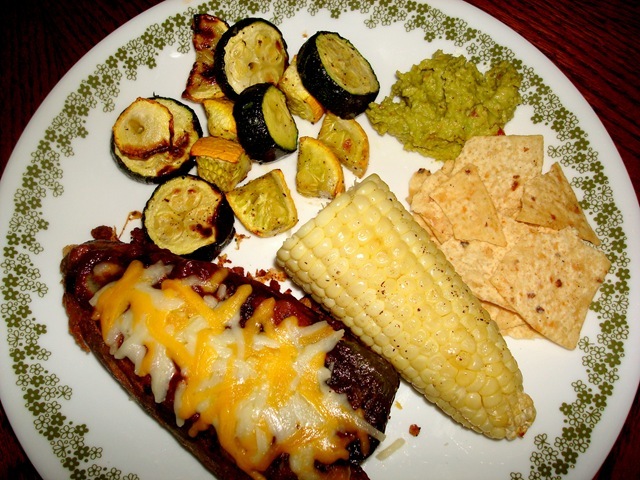 Posted in Food, Pictures, Recipes and tagged chile rellenos, meat, Mexican, recipes, turkey. Bookmark the permalink.